Zephyrinus, a native of Rome, succeeded Victor in the pontificate, in the year 202, in which Severus raised the fifth most bloody persecution against the Church, which continued not for two years only, but until the death of that emperor in 211. Under this furious storm this holy pastor was the support and comfort of the distressed flock of Christ, and he suffered by charity and compassion what every confessor underwent. The triumphs of the martyrs were indeed his joy, but his heart received many deep wounds from the fall of apostates and heretics. Neither did this latter affliction cease when peace was restored to the Church. Our Saint had also the affliction to see the fall of Tertullian, which seems to have been owing partly to his pride. Eusebius tells us that this holy Pope exerted his zeal so strenuously against the blasphemies of the heretics that they treated him in the most contumelious manner; but it was his glory that they called him the principal defender of Christ’s divinity. 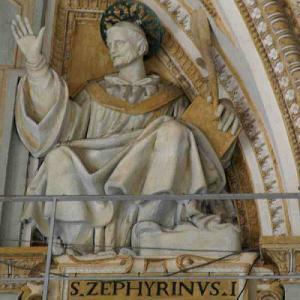 St. Zephyrinus filled the pontifical chair seventeen years, dying in 219. He was buried in his own cemetery, on the 26th of August. He is, in some Martyrologies, styled a martyr, which title he might deserve by what he suffered in the persecution, though he perhaps did not die by the executioner.